I have a photography project called "My Backyard". As far as backyards go, my backyard is quite beautiful. But.... given human nature, it's easy to take this beauty for granted. Thus, the goal of my project is quite simple - I'm attempting to see the beauty at hand with a fresh eye, looking for the extraordinary within the ordinary! hello my friend... lovely blog..and gorgeous photo!! love your backyard shot .. so well framed among the trees . sun and snow! How wonderful to have a backyard like yours. What beauty to wake up to! 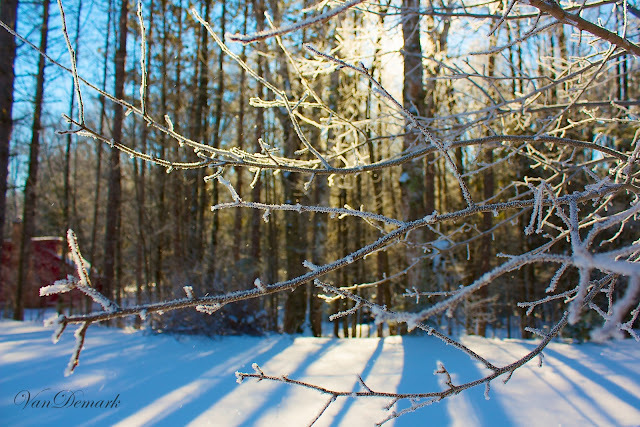 I love the way you've captured the frost on the branches and the shadows in the snow with the sunlight filtering in through the trees. I appreciate the lovely quotations you sometimes put with your photos.